Went out again with friends from work (Woohoo! See, we're outgoing!) yesterday. We all met up at SM Mall of Asia after their shifts and had lunch at BonChon. 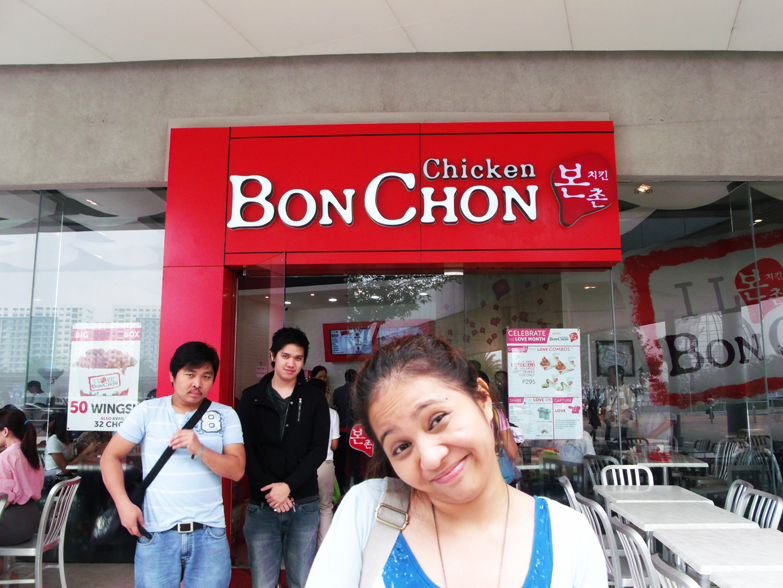 I recommended BonChon to John and he wanted everybody to try the food there. 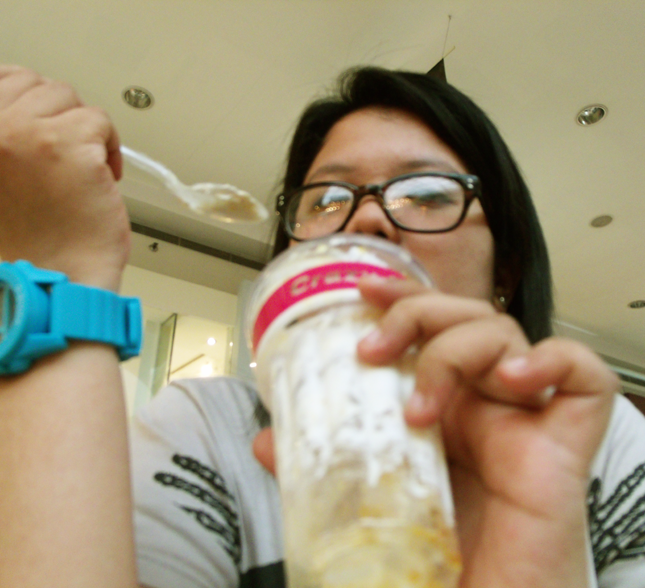 I was glad that they liked it, even the Korean yogurt. 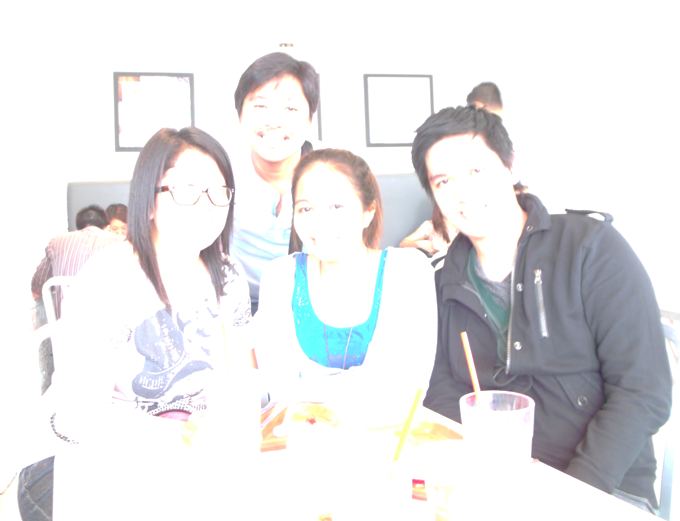 Over exposed. Randy behind the camera. Yep. Confirmed. They love BonChon. Original plan was to watch Underworld 3. And again, we changed our minds. First, it was ice skating (LOL, can't imagine myself!) but since Zel needs to go home early, we decided to just crash at John and Randy's place to have a few drinks. 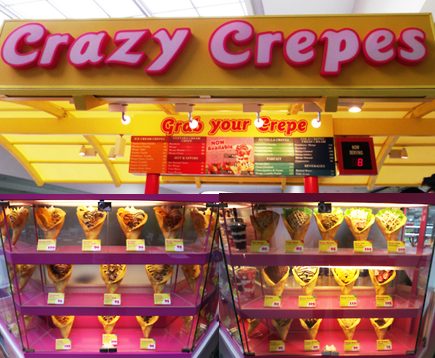 I finally got to try Crazy Crepes! But yeah, I was not crazy about it. Instead of ordering a crepe, I opted for the Mango Crumble (in a tall plastic cup) because of our original plan of watching a movie, I thought it would be more convenient of eating it this way. The food on the display is actually visually stimulating, with all the colors and flavors you see and you can choose from. That's why people are intrigued to try this food joint (and of course, if you love crepes). 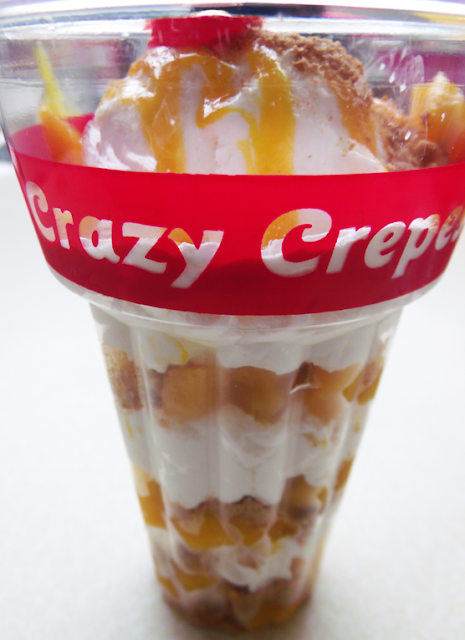 At first, I found it yummy, vanilla ice cream on top with crumble and mango sauce drizzled and a lot of mango chunks. 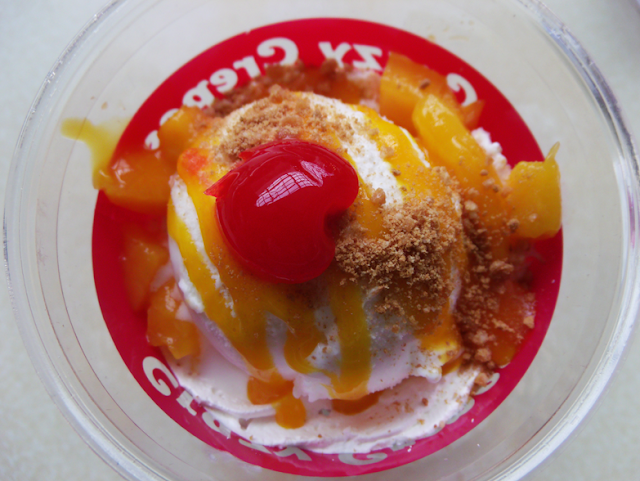 But after that layer, it was just a lot of whipped cream and mango chunks and more crumble. You get lost with all that whipped cream, actually. Whipped cream wasn't even chilled that's why after the first layer, you realize something seems to be amiss. To conclude, it's a bit pricey for the quality but nonetheless, an a-okay dessert. I'll try the Mango Nutella Crepe next time, hopefully, I'll enjoy it more! Of course, what blog post about a trip to SM Mall of Asia is complete without a view of the sea. Hehehe. And it rained pretty hard that day, I hated it. Oh well, we still did go to their place and drank Tanduay Ice and Antonov. And later that day, I ended up confessing a lot of things to them. Hahaha. Ed and John acted like my psychologists figuring out what I should do with my life. It was hella fun! Everybody has their own problems to face and I'm glad they gave a much needed advice on how to proceed with my life. And as they said, the final decision is still upon me. Life changing decisions are not also made overnight. Time is running but I still have to figure out how things will work for me. I'll get back to that, let me just finish this cup of whipped cream. Hahaha. Though John was giving another advice that he described as "liberating" that I don't want to divulge any more other than that word because it pretty much sums up what he was trying to say and it was just so hilarious that at some point I kept telling him, "John, tumigil ka na nga!" Hahaha. Thank God for crazy (in non psychotic kind of way) friends.